Every person, including the elderly, needs snacks daily, despite what you may have heard about them causing weight gain. The key is to factor snacks into your overall daily calorie intake. Snacking helps to increase your intake of vital nutrients and boosts your overall health. So keep these healthy snack ideas for the elderly in mind the next time you go grocery shopping. Calcium, the most abundant mineral in your body, plays a role in a wide variety of functions such as muscle function, nerve transmission and heart function. It’s also essential for building and maintaining bone. As you get older, bone loss is a particular concern, especially if you’re a postmenopausal woman. Also, you’re more vulnerable to cardiovascular diseases. 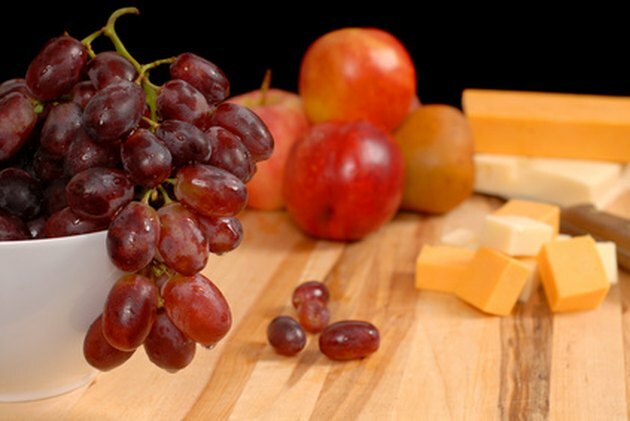 Add calcium-rich snacks to your daily diet. Good options include low-fat or fat-free cheese cubes or yogurt, or sardines on whole wheat crackers. Fruits are loaded with nutrients such as vitamins, minerals and fiber that help to fight the damage and deterioration that is associated with aging. For instance, carotenoids are potent antioxidants that help to fight free radical damage and inflammation, which triggers immune responses related to aging and disease. They can help to prevent or treat inflammatory conditions such as cancer, heart disease or arthritis. Eat about 2 cups of fruits, such as berries, cherries, apples, oranges and pineapple, daily. Like fruits, vegetables are also rich in vitamins, minerals, fiber and antioxidants. However, non-starchy vegetables are much lower in sugar than fruits, especially green leafy vegetables. As you get older, you’re more likely to develop insulin resistance, which means your body cannot efficiently use the insulin it produces. This makes you susceptible to type 2 diabetes and other health problems. Due to their lower sugar content, vegetables help to keep your blood glucose levels stable so your body doesn’t need to produce as much insulin. Try snacks such as carrot or celery sticks with dip, veggie kebabs with a mix of vegetables on a skewer, or grilled asparagus with low-fat cheese wrapped in a whole-grain tortilla. Timing your snacks properly throughout the day makes a difference, according to NOAH Net Wellness, a University of Georgia site about nutrition for older adults’ health. For instance, if you’re hungry but don’t intend to eat for about an hour, choose a 100- to 200-calorie snack, such as a handful of popcorn or a medium piece of fruit. If you won’t be eating for a few hours, choose a snack of about 200 to 250 calories, such as a sliced apple with peanut butter or a small whole-grain muffin with a cup of low-fat milk. Also, keep healthy snacks on hand so you don’t turn to less healthy options when you become hungry throughout the day.